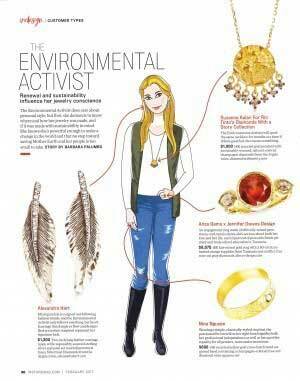 Great coverage of the contemporary jewelry consumer’s picks: an Environmental Activist using her purchasing power to better the world! Thank you Barbara Palumbo for a great feature in InStore Magazine. Have you noticed that becoming an Activist is happening more often? See here the Pure Flight Collection: Feather Earrings made from 100% reclaimed metals and 100% sustainably mined Australian diamonds: contemporary and statement!